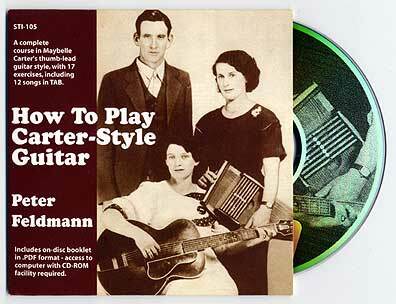 STI-105 "How To Play Carter-Style Guitar"
STI-105-CD "How To Play Carter-style Guitar"
This CD is designed to teach Maybelle Carter's wonderful thumb-lead guitar style by ear. It contains 17 tracks with 18 exercises, including 12 complete songs, plus an ad ditional sample song illustrating the style. Besides the music tracks, a booklet containing tablature ("TABs") to all the exercises is included on the CD for you to print out and study. whch can read standard CD-ROM discs. .
Just had to drop you a line and tell you I think "How To Play Carter Style Guitar" is fantastic! It's exactly what I've been looking for. I started playing guitar 3 years ago and have been looking for some instruction on Carter style but never anything that worked (for me, anyway). I'm now ordering a second copy for my guitar teacher who loves it! Thanks again."